Looking for an employee with coding skills? Interested in becoming a Montana Code School student? 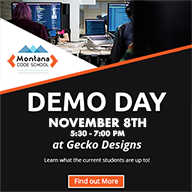 Join us for Montana Code School’s Demo Day to meet our talented students who will be available for hire starting in December 2018. Our students are ideal candidates for tech companies looking for software developers and interns. Montana Code School alumni have joined Submittable, Partners Creative, ATG, Cedar Mountain Software, Workiva, and others. Free Beer and Food Provided! Database choice was mongoDb for it’s flexibility and integration with Node. Our servers are built out with the Express framework and the projects were rounded out with the addition of some web sockets and google Oauth. The forces of nature are at your disposal in this exciting digital card game brought to you by MTCS! Dominate your foes using the power of Fire, Water, Earth, Light, and Shadow! Play now for free! Self-knowledge is the beginning of ALL knowledge. Sign-up today and get to know yourself. Montana Code School exists to launch students’ careers in software development and to contribute to our growing tech community. We prepare students for rapid placement in business as well as for entrepreneurship. We teach our students how to learn software programming so they can thrive in various tech environments. Our students are creative, agile and logical thinkers that also learn empathy, collaboration, and strong communication skills. We believe that the best way to learn includes teaching, and we experiment with ways to encourage students to teach and support each other. We use the best tools and philosophies we know of for generating great software, building great teams, offering great experiences to those who use our software and producing real business value from our work. This includes ideas from the Agile Manifesto and the Agile software community, Lean Manufacturing, Accelerated Learning, Positive Psychology, the newest Brain Science, and more. We rely on quick feedback loops. We have a plan, but we adapt based on what works. Play is perhaps the best learning tool of them all. Fun, Joy and Happiness are not optional!